Even as distributed solar PV systems become increasingly common, utilities’ interconnection processes are often lengthy and problematic. 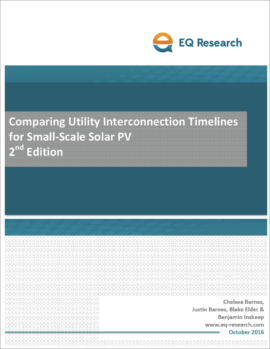 This report by EQ Research, published in October 2016, is an update to a report published in 2015, and compares how interconnection timelines have improved – or worsened – for individual utilities in recent years. While several individual utilities improved their interconnection timelines, utilities on the whole took longer to process interconnection applications and grant permission to operate (PTO) for small PV systems (10 kW or less) installed in 2015 than in 2014. The report found that the average pre-application waiting period rose by 57 percent in 2015 compared to 2014, while the average post-construction waiting period rose by 103 percent. Increasing delays are leading to higher levels of consumer frustration. The report synthesizes the results of a survey of solar installers, using data collected for 62 utilities in 20 U.S. states and Washington, D.C. Though pre-construction approval was slower on average across all utilities, fifteen utilities demonstrated faster pre-application timelines in 2015 than in 2014. However, PTO timelines were significantly slower in 2015; 40 utilities took longer to process PTO in 2015 compared to 2014, and only five utilities reduced their average PTO waiting periods: FirstEnergy, in Maryland; Con Ed, in New York; Delmarva Power, in Maryland; Tucson Electric Power, in Arizona; and the Delaware Electric Cooperative. Based on interviews with PV installers and utilities’ interconnection staff, this report identified several key issues that cause delays, while recommending best practices for expediting the interconnection process. The full study and its recommendations — available for free — may be downloaded using the form to the left, and a blog summarizing the report findings is available here.